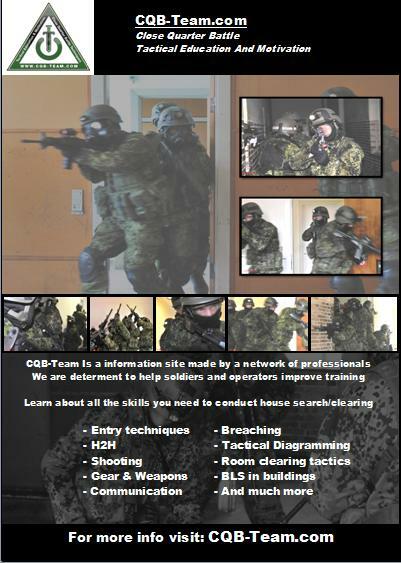 Thank you in advance for your mentioning CQB-Team.com on your site! We offer the option for you to become an official sponsor of CQB-Team. Being a sponsor you will get your banner placed on CQB-Team in the right column at a page of your choice. $150 a month: Frontpage/Index - Tactical Trainer. $100 a month: Shop - Links - Support us - About us - Hand 2 Hand - Shooting - CMMS Mentality - Gear - Weapons - Signals - Breaching - Florplans - Second Clearing - BLS - Action Card - Courses - Career - Online Reading - Articles. The banner you provide must have the following size: wide: 180 pix height: 60 pix. The price varies from $100 - $150 per month depending on which page you wish to show your banner, always starting from the 1st in every month. If you purchase more than 4 months in advance we will give you a discount of 10 % of the full period. If you wish to have a banner for a year or more, please contact us for a better discount. Please use our contact form to learn more. Type OFFICIAL SPONSOR in the topic. Help us help others by printing and hanging this poster any place you might think that operators will se it. Click on the picture below to open the poster in PDF format. Feel free to download our logo and use it for linking.